SPEND YOUR TIME MORE EFFECTIVELY WITH CLIENTS. WE’LL SHOW YOU HOW. 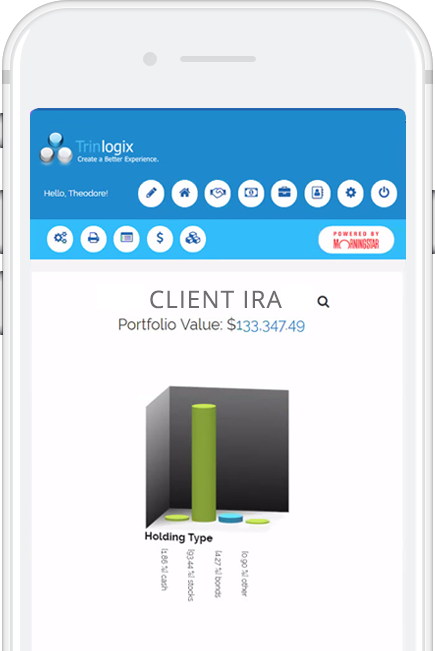 Trinlogix offers patented, award-winning investment performance measurement tools for financial professionals to provide clients with a clear, easy to understand 3D snapshot of their investment portfolio. The Trinlogix platform is a perfect performance measurement tool for long-term investment strategies. Investment advisors and financial planners can quickly and succinctly demonstrate investment performance over short and long periods of time. Understanding investments can be complicated. We keep it simple. We help mutual fund manufacturers spend time more effectively and drive credibility among clients. Trinlogix technology provides enhanced client experiences compared to traditional platforms. As a wealth advisor, you know the importance of building strong client relationships that increase engagement and build wealth portfolios. Our financial technology helps you manage private wealth in the most efficient and clear way possible. Trinlogix offers an array of features to help you spend your time more effectively and drive credibility among your clients. Trinlogix has the ability to fully integrate its tool into a website or other portal. The software has the API carry out actions on its behalf using authorization tokens. The database has unique users, which limit what data certain parts of the software can access. better, clearer client experience compared to traditional, non-technological financial reporting methods. We beat the glossy-eye syndrome and make life easier for financial professionals and their clients. "It quickly highlighted my unique service"